Ok, I think I’m showing my age here. I don’t know when the birth story trend started, but I don’t think I heard about birth stories until after #4 or #5. As a part of an online friend’s link up (Blair: The Straightened Path), I’ve decided to share a birth story. I’m not going to tell all six (you’re welcome), so it was tough figuring out which one to share. Each one is different and each baby’s entrance is worth sharing. I decided posting Esther’s birth story was the way to go (#5). All six of my children have been born via cesarean section. Yup, all six. My first labor and delivery was heart breaking (not to be confused with devastating). My plan was to have an all natural birth at the hospital for the first so my hubby (Paul) could see how easy it was and then I would have all the rest at home, preferably water births. Ummm… yeah, not so much. 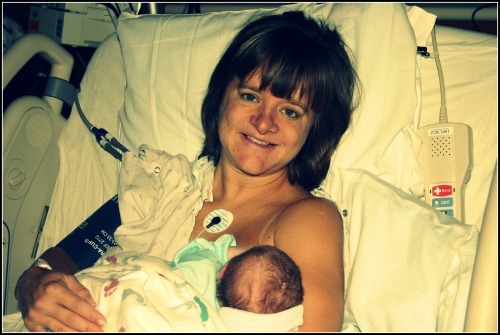 Due to a bone disorder, my body will not delivery babies via the original plan. You can read my full first birth story in my book Make the Most of Your C-Section: Prepare for a More Natural & Personalized Birth. It also explains why I wrote the book. At least, it explains why the seed was planted. The five c-sections that followed and being passionate about women having personalized birth experiences in the OR is why I wrote the book. 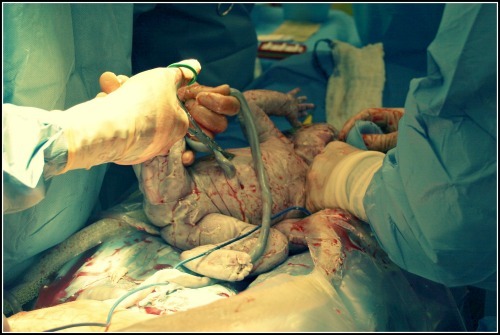 You can also read this post that eludes to a lot of first c-section struggles. Anyway, with baby #5, we had the date set pretty early. I was due the first week in September and chose August 31st. This was my first third trimester summer… I thought I was melting and spent many days scantily clothed in the house with my short hair up in four clips, telling Paul, “I’ll pay for Noah’s therapy later! I’m miserable!” We chose that date because it was my mom and dad’s 20th wedding anniversary. Per my rule, the c-section was first thing in the morning, so we got up at holy-stinkin-cow-it’s-early o’clock. I showered, did my hair & makeup (yes, seriously… though the photo at the end doesn’t prove that… post surgery puking, crying and such don’t go well with photos), and we drove in the dark to the hospital, with my friend Jan in tow. She had come to be with us the night before. My closest friends, my sister, and my mama all came. I’m not sure if they were there to see the baby or my henna tattooed belly. I’m kidding. I know they were there to see the baby. I have been blessed to have friends and family at every delivery (except the first). They pray with me before the surgery and they celebrate with me after the baby is introduced to everyone. Those five mornings have been some of the most special of my life, for obvious reasons, but it means more than I can say that people I love chose to sacrifice time and effort to come be with me. Precious. Anyway…. while I was kidding about why they were there, I wasn’t kidding about my henna tattooed belly. I had decided (after studying India with my kiddos) that I wanted to decorate my belly, so Hannah Beth and I had a special outing getting my feet & belly and her arm henna tattooed. The sweet Indian woman was a bit baffled at my request. I had the top part decorated with traditional art, but the bottom had the words “cut on the dotted line”. You should have seen the nurse’s face when she lifted my gown to put on the heart monitor. Price.less. Dr. Ramsay’s was even better. Anyway, on top of my loved ones being with me, I had a repeat nurse: Amy. Amy was my wonderful nurse with Phoebe and when she saw my name on the calendar, she scheduled herself to be my nurse. How awesome is that? Great big stinkin’ heck awesome. As we did the typical intake info that morning, and after getting nurses to come see my belly art, Amy realized I had never seen my babies au naturel up close and personal at birth. I had requested, to no avail, every time for a mirror to watch the baby come out. On top of that, the baby was always taken straight to an incubator about ten feet away, so there was no birth moment viewing. It was difficult to see them since there was always quite a bit of activity around the warmer. Amy was determined this delivery would be different for me. She championed my wishes of wanting to see the baby above the “curtain” just after delivery. Paul and I held hands waiting for the big moment, the let go to take photos. I saw his eyes light up and announce it was a girl, then… I saw my baby straight from my womb held up in all her glory for me. I will never forget the moment. Ever. She was beautiful. The moment was amazing. My joy was boundless. I had some pretty uncomfortable adhesions after awhile and don’t remember much about holding Esther in the OR. She left with Paul while they finished the tasks necessary and I was in and out of clear mindedness (my book talks about how to avoid this… wish I had known!). I felt pretty yucky during “recovery”, but was eager to see my loved ones and to celebrate. We always have cake and banners. Esther’s (she wasn’t named until day 3) birth was no exception. I loved getting to hold her, nurse her, and watch others love her from the moment she arrived. True, I had no water birth at home, but my daughter and I were safe, together and basking in the goodness of family. My henna belly was empty, but my heart was full. If you’d like to learn ways to make a planned or unplanned c-section personal and more natural, buy my book!